The Edithorial: Cheiron the Centaur for Minister of Education! A Warsaw conference on mythical beasts allowed me to celebrate the centaur Cheiron. Where other centaurs are hyper-randy,tanked-up brutes, Cheiron is an expert in healing, botany, lyre-playing and hunting. He teaches these skills to heroes in childhood and adolescence. He is an Agony Uncle and initiation guru who gives youths romantic advice. But, far more excitingly, he is also the ONLY ancient Greek author with a non-human lower body. 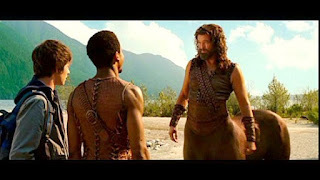 There was a poem as old as Homer and Hesiod called the Precepts of Cheiron, addressed to the teenager Achilles. 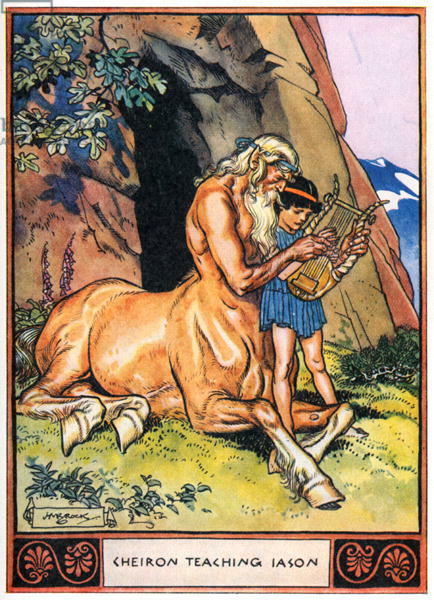 It consisted of Cheiron's own timeless wisdom for all children and the people raising them. In our days of compulsory testing of the literary and numeracy of even the very young (in my view, year 2 SATS are a form of child abuse), it's good to recall that Cheiron said that forcing children to read before the age of seven was counter-productive. * Cheiron for Minister of Education, say I! Sadly, his poem has not survived except in fragments. Nor has the other poem in which he starred, the Cheironeia. 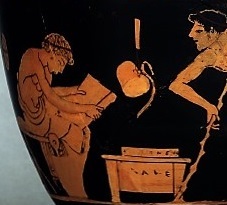 Panaitios, the youth seated left on this vase in Berlin, is reading this epic intently in the presence of his tutor. The vase tells us that the both the boy and the poem are BEAUTIFUL. The Greeks, then, would be shocked at how we ‘educate’ our four to six-year-olds. But they wouldn’t be surprised at the popularity of centaurs in modern youth culture. 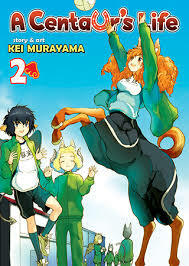 I spent hours this week baffled by the explicit initiatory adventures of she-centaur Himeno Kimihara, in the bestselling manga series A Centaur's Life, until my own youngest teenager patiently explained that you start such books at what I call the ‘end’, the right-hand cover as you hold it. But the best find of the week was this old bike advert. Cheiron, who had attempted to teach the youth to ride a horse, is in my view not racked with envious desire for a velocipede. He doesn’t need one. What he is actually planning is a centaur revolution: ‘four legs good, two wheels bad’. * That seven is the earliest age (aetas) at which a child is able "intellectum disciplinarum capere et laborem pati" was a Cheironic Precept (Quintilian Inst. Orat. 1.1.15).